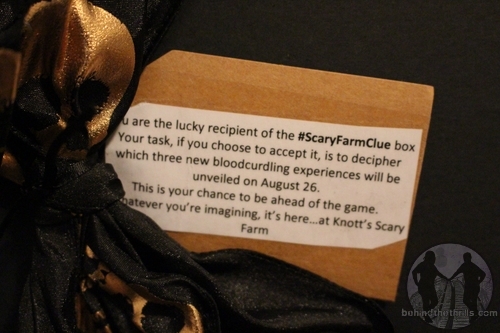 Behind The Thrills | Mysterious package gives clues about Knott’s Scary Farm! Mysterious package gives clues about Knott’s Scary Farm! Knott’s Scary Farm has already revealed a ton of details about to strike year’s event. A new maze, a few returning mazes, and Elvira. That’s a major jump on this year’s 11 mazes, scare zones and shows. We thought the big announcements were done, and we were just going to get a line up on August 26th, when Knott’s brings in passholders for the annual Scary Farm announcement event. We thought we were safe. We were wrong. I love mysterious packages, but this one caught me completely by surprise. As I unwrapped the box, and opened it, a mystery unfolded in my hands. Well…it is a mysterious package afterall. 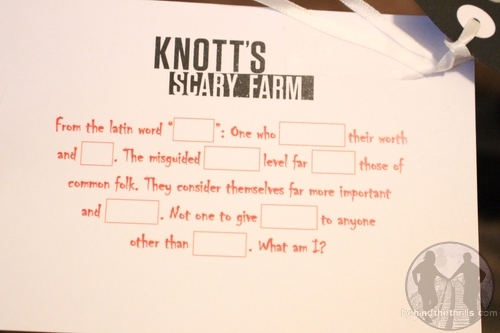 No, this box has all the clues we need to unlock the secrets of Knott’s Scary Farm early. The obvious comparison is to Halloween Horror Nights Orlando, which used to send out mysterious packages all the time. 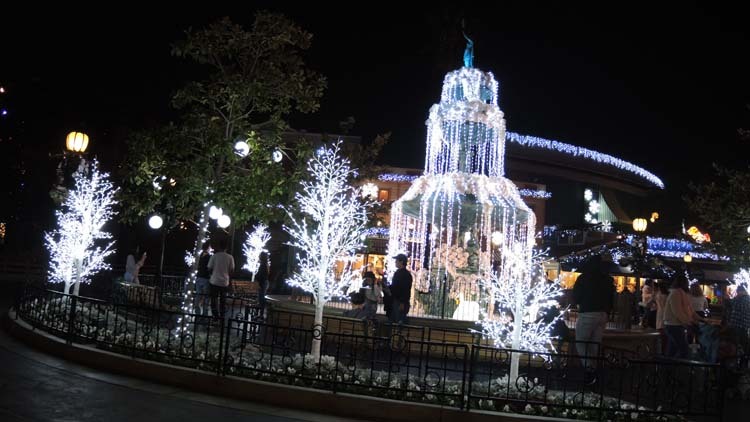 This seems to be a first for Knott’s, and quite frankly, we love it. There’s a very puzzle like aspect to it, and it’s helping to get immersed into the event. I can’t wait for more. The first thing isn’t in the box, but on it. It’s the first clue, of sorts, that tells us we are on the hunt for clues. With that information we know there will be three all new experiences. This is apparently in addition to the new maze that was announced already. So what are the clues? We’ll break down the clues, and go by each piece of evidence. There are three total clues, and each clue has several different pieces. 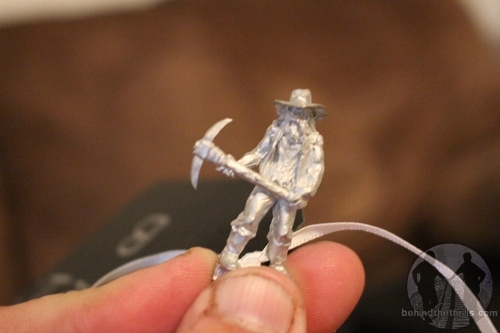 We’re going to say that this one has something to do with Calico Mine Train. Could they be doing a haunt layover? The hospital bracelet has my name on it, along with a patient number. There is also a number to call for a paranormal research firm. The number is (844) 666-1973. 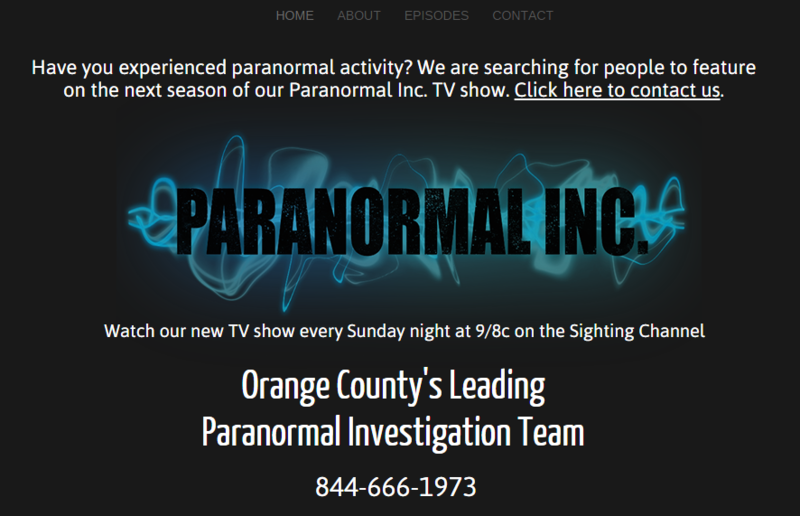 It gives you to a website to report paranormal activity for a new show. 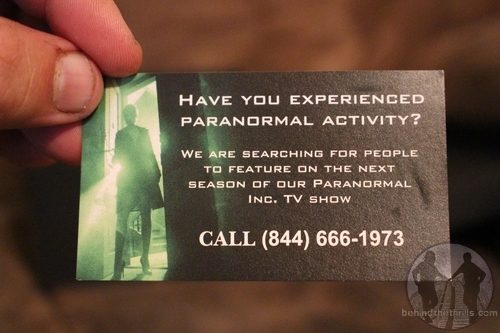 Update- The phone number gives way to a new website for the paranormal research team. There isn’t much on the site, but what is there is interesting, especially given the “Episode List”. This list of episodes definitely sounds like a list of haunted attractions. In fact, Manor on 13th street is a haunted attraction in Alberquerque, NM and in Colorado. Hollywood Tower Hotel is the fictional setting of the Tower of Terror attraction at Disneyland, right down the road. It’s also a real ex hotel, turned apartment building. Anaheim Asylum could mean a fictional asylum, or it could mean the place where refuges from other countries come to seek political asylum…again a real place. Stanley House is a sober living facility in Los Angeles. It’s also a historical house and museum in Garden Grove, CA. That place is said to be the sighting of tons of paranormal activity. In fact, just about most of these listed in the episode list are actually haunted places. There are some that aren’t specific enough, such as the Haunted Shed, The Toy Factory and Mrs. Hornaday’s House. The rest are real honest to goodness places that are said to be haunted. The prevailing theory here is that, yes, this new experience will have something to do with toys, and perhaps an asylum…but whatever it is will have a paranormal research aspect to it. The other thought, seeing that this was a very specific patient number, is could this be the start of a new upcharge house? 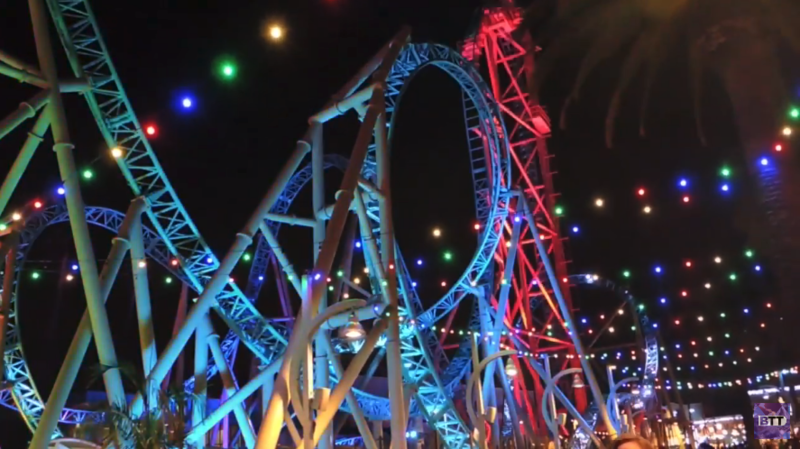 The Experiment did very well at Knott’s, but it was confirmed to not come back. Could this new experience be a new upcharge experience in which guests will go on a paranormal hunt? That’s not a lot to go on, is it? We’ve slowed down the audio and could find nothing, but we were able to slow down the video, and clear it up a little bit. What we found was a bit…well…strange. 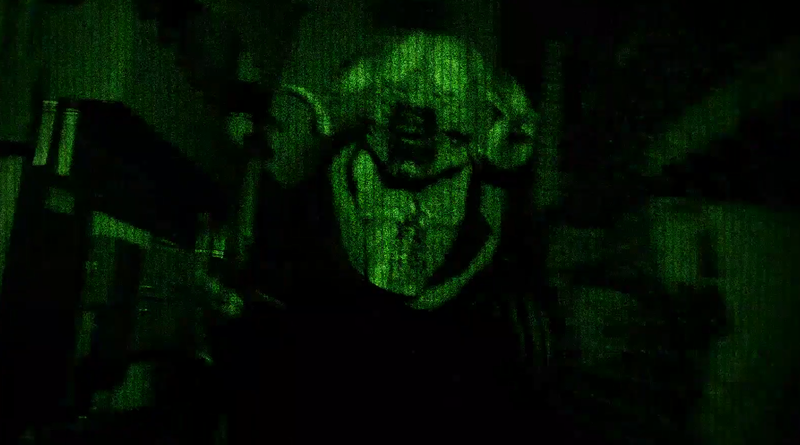 If that’s what they summoned while doing their latest episode, and this is what is waiting for us at an all new paranormal research maze, then I think we’re all in trouble if this thing gets unleashed. That’s not a typical ghost, but a demon. I think that the gang at Paranormal Inc. might have stumbled onto something a little bit more than they bargained for. Zoinks. A-Postcard with Green Witch and tricksters. Riddle on the back with missing words. There are several missing words in the riddle, and not going to lie…have no idea what it’s referring to. This is something to do with the Green Witch, and the Tricksters. Yeah…not much help. A few people have suggested that this one is a take on the Seven Deadly Sins. It’s a bit of a stretch, but we’re not 100% sure on it. Still working on the missing words. What are they? Pride. It’s one of the seven deadly sins. Rick from Theme Park Adventure got a similar card, and was given Wrath. Parks and Cons also received a card, Sloth. Not sure who the other three to get them were, but we’re guessing the other four of the seven sins were involved. This is all thanks to TPA, but it’s looking like the seven deadly sins will accompany the Green Witch. We’ll find out soon! Knott’s is already lined up to have a legendary year at Haunt. If they could incorporate the clues and games into the houses and even online, it would add a new level of immersive storytelling that other haunts have toyed with. All of the details about this year’s Scary Farm will be revealed on August 26th. 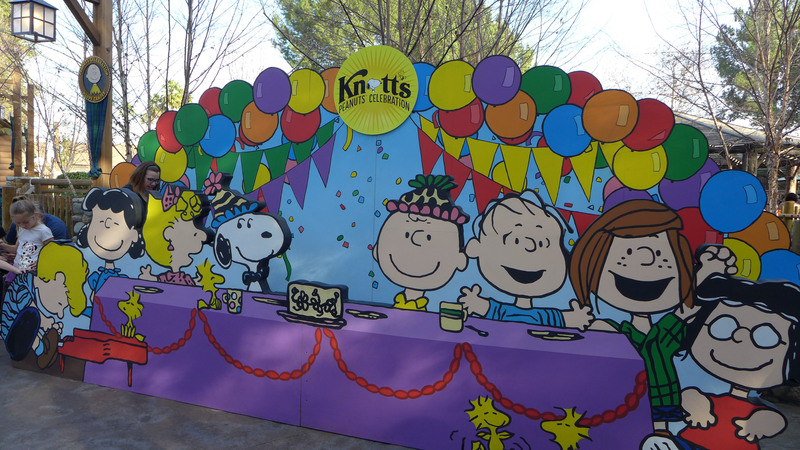 Stay tuned for more from Knott’s, and be sure to get social with us on Facebook and follow along with us on Twitter @BehindThrills for the latest updates!